Louise Élisabeth by Jean-Marc Nattier, c. 1754. Louise Élisabeth de France (Marie Louise Élisabeth; 14 August 1727 – 6 December 1759) was the eldest daughter of King Louis XV of France and Maria Leszczyńska. She married Infante Philip, younger son of Philip V of Spain, and later became Duchess of Parma. Baptised with the names Marie Louise Élisabeth she was the twin of Henriette of France. She was known at court as Madame Royale, Madame Première or Madame Élisabeth. Within the family she was known Babette. She was he fathers favourite daughter. She was forced to marry Infante Philip of Spain by proxy on 26 August 1739. not having met her future husband beforehand. Afterwards, she was known as Madame Infante at the court of Louis XV. The marriage ceremony took place on 25 October 1739. She was known as Madame Infante at Versailles after her marriage. Louise Élisabeth travelled to Madrid to the court of Philip V of Spain who was in fact her great uncle. The strict court etiquette was made worse by her mother-in-law, Elisabeth Farnese, who disliked Louise Élisabeth. 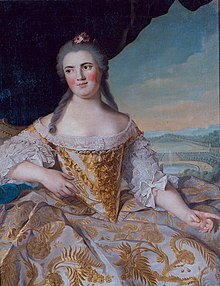 Louise Élisabeth was able to leave Spain in 1748 when her husband was created Duke of Parma thanks to the Treaty of Aix-la-Chapelle (1748) which ended the War of the Austrian Succession. At Louis XV's instigation, Philip was given Parma as Louise Élisabeth had frequently asked him to bestow territory on her husband. En route to Parma, Louise Élisabeth went to Versailles arriving there in December 1748. During her stay she became acquainted with Madame de Pompadour. She arrived in Parma in October 1749 where she imported French court manners and cuisine. She also redecorated the Ducal Palace of Colorno in the French style. At the death of her twin sister in 1752, Louise Élisabeth returned to France in September to visit her tomb at Saint-Denis. She was expected to stay for only a few weeks, but remained in Versailles for almost a year. Louise Élisabeth was bored when she returned to Parma, and sought a wider realm to rule. She allied herself with Empress Maria Theresa, who promised Louise Élisabeth the throne of the Southern Netherlands, which had been returned to Austrian rule under the Treaty of Aix-la-Chapelle. This alliance was to be cemented by the marriage of her daughter Princess Isabella to Archduke Joseph of Austria. The marriage took place in 1760. While back at Versailles, Louise Élisabeth died of smallpox. She was buried on 27 March 1760 at Saint-Denis Basilica beside her sister, Henriette. Their tombs were destroyed during the French Revolution. Isabel of Parma (31 December 1741 – 27 November 1763) married Archduke Joseph of Austria and had issue. Ferdinand, Duke of Parma (20 January 1751 – 9 October 1802) married Maria Amalia of Austria and had issue. Maria Luisa of Parma (9 December 1751 – 2 January 1819) married her cousin, the Charles IV of Spain and had issue. In France the princess was informally known as Madame Infante. This page was last changed on 8 April 2019, at 13:13.